SysToMath Tool Aids C++ Library (stmtoolaids). The SysToMath Tool Aids C++ Library consists of several library objects providing various macros, functions, function templates, classes and class templates facilitating some tool related computational tasks. Central include file for SysToMath Tool Aids C++ library. Collection of some abstract binary message model related utilities. Collection of some ClearCase cleartool related utilities. Collection of some DSP message model related utilities. 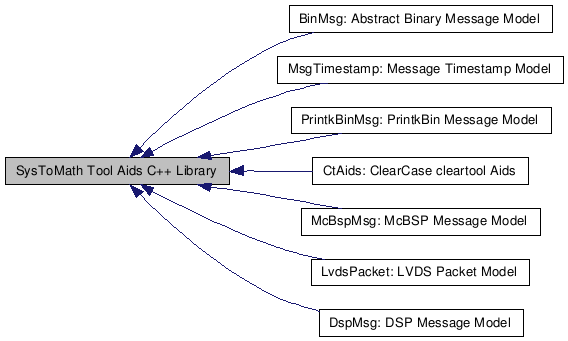 Collection of some LVDS Packet model related utilities. Collection of some McBSP message model related utilities. Collection of some message timestamp model related utilities. Collection of some PrintkBin message model related utilities.